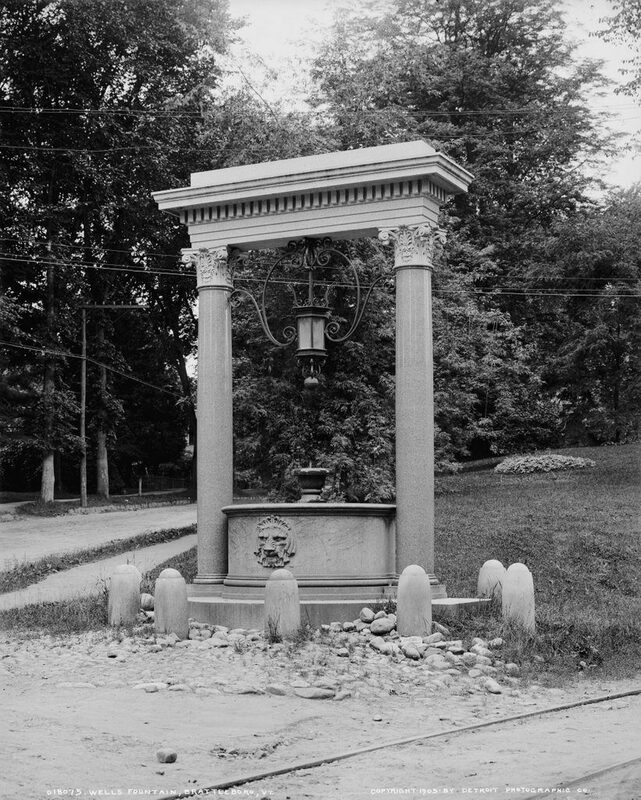 The Wells Fountain, at the corner of Putney Road and Linden Street in Brattleboro, around 1905. Image courtesy of the Library of Congress, Detroit Publishing Company Collection. 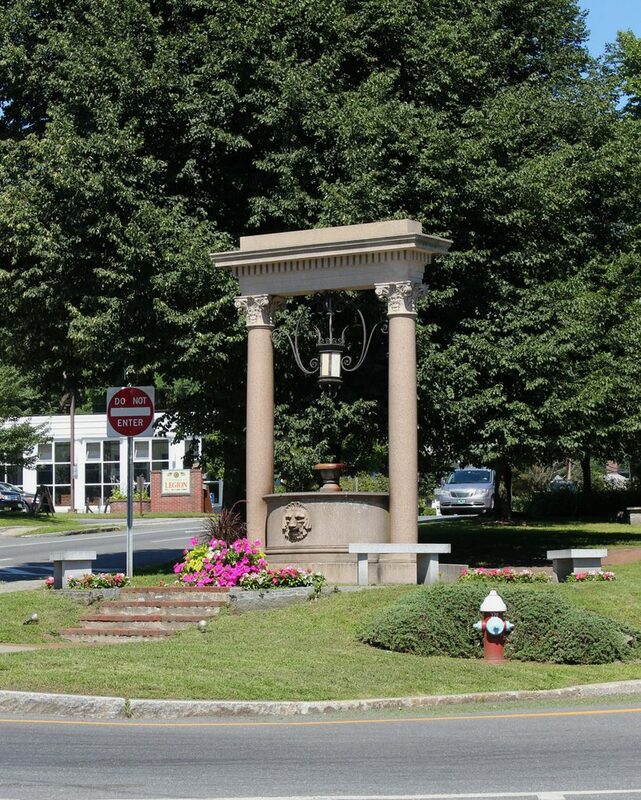 The Wells Fountain has been a feature here in the center of Brattleboro since 1890, when it was given to the town by William Henry Wells, a New York businessman who had grown up in Brattleboro. The fountain was originally located about 20 feet from here, but it was moved to its current site in 1906. 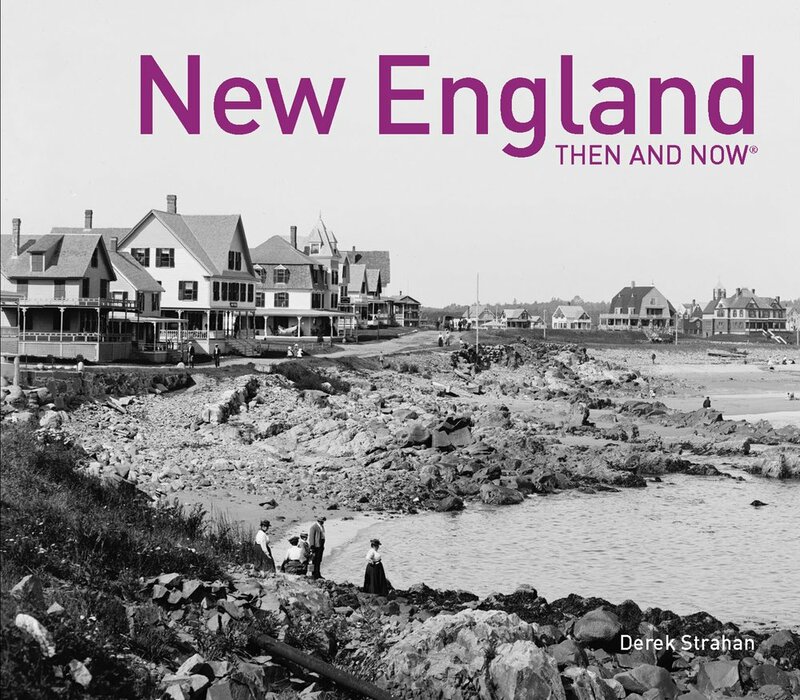 The first photo appears to have been taken shortly before this move, because the photo shows it closer to the street than it is now, so the original location was probably on the far left side of the present-day photo. The fountain was the the work of William Rutherford Mead, a noted architect who, like Wells, was a Brattleboro native who moved to New York as an adult. Mead was a cousin of President Rutherford B. Hayes, whose family also had roots in Brattleboro, and he was a partner in the prominent architectural firm of McKim, Mead & White. Mead did not have the same architectural genius of his two partners, Charles Follen McKim and Stanford White, and he designed few works on his own. Instead, his talents were as an office manager, serving as a stable, practical-minded counterbalance to the more fanciful McKim and White. 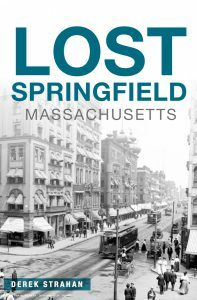 Under his leadership, the firm became one of the country’s leading architects of the late 19th and early 20th century, with commissions such as the Boston Public Library, the Rhode Island State House, and Penn Station, along with many other public buildings and Gilded Age mansions. The original location of the fountain marked the spot where Mead’s older brother, Larkin Mead, had created an eight-foot-high snow sculpture in 1856. The Recording Angel, as it was called, stood here for about two weeks, and the subsequent publicity helped to launch his career as prominent sculptor. He would later go on to design works such as the statue atop the Vermont State House, a statue of Ethan Allen in the United States Capitol, and the statues on Abraham Lincoln’s tomb. He died in Florence, Italy in 1910, and his grave was topped with a replica of his original Recording Angel sculpture. Today, the Wells Fountain still stands here at the corner of Linden Street and Putney Road, although its surroundings have changed significantly. The trolley tracks in the foreground of the first photo are long gone, as are many of the surrounding buildings. The land just up the hill behind the fountain was once privately owned, with a house that once stood just out of view to the right. However, this land is now a small public park in front of the courthouse, and part of the foundation of the old house can still be seen on the far right side of the present-day photo.